The Rasmussen Reports daily Presidential Tracking Poll for Monday shows that 36% of the nation’s voters now Strongly Approve of the way that Barack Obama is performing his role as President. 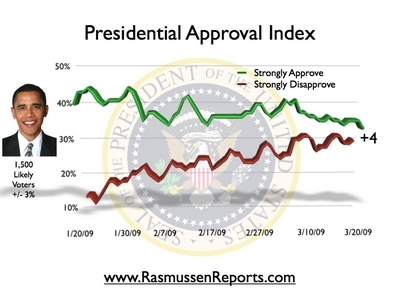 Thirty-one percent (31%) Strongly Disapprove giving Obama a Presidential Approval Index rating of +5. At the time of his inauguration, Obama’s approval rating was above 40% with only about 16% stongly disapproving. America’s Political Class gives Treasury Secretary Timothy Geithner rave reviews: 76% have a favorable opinion of him. Two-thirds (66%) of the Political Class say Geithner’s doing a good or excellent job handling the credit crisis and federal bailouts. However, the latest Rasmussen Reports national telephone survey found that America’s Populists see things from an entirely different perspective. Just 12% of Populists have a favorable opinion of Geithner, and only 11% say he’s doing a good or an excellent job. Most Populists (53%) rate Geithner’s performance as poor, but not a single Political Class survey respondent said the Treasury secretary is doing a poor job. The findings are especially telling as calls increase for Geithner’s resignation following the disclosure that American International Group (AIG) paid its executives $165 million in bonuses after receiving a $170-billion taxpayer bailout to stay in business. Geithner was aware of the bonuses and did little or nothing to stop them. Overall, among all adults, 24% have a favorable opinion of Geithner, 44% have an unfavorable opinion, and 33% are not sure. Twenty-one percent (21%) of adults say Geithner is doing a good or an excellent job while 40% say he is doing a poor job. Two-out-of-three Americans (67%) believe that politicians who received campaign contributions from American International Group (AIG) should return the money. The latest Rasmussen Reports national telephone survey found that just 21% disagree and 13% are not sure. The belief that the politicians should give back the money is shared by a solid majority of every measured demographic group except one – America’s Political Class. In that elite group, just 29% think the contributions should be returned while 63% reject that idea. Among America’s Populists, 77% believe the campaign cash should be returned, and only 14% disagree. Most Americans have Populist attitudes. and their perspective can reasonably be considered the perspective of Mainstream America. The Rasmussen Reports daily Presidential Approval Index for Friday shows that 38% of the nation’s voters now Strongly Approve of the way that Barack Obama is performing as President. That’s the fourth straight day below the 40% level for the President. Prior to that, the number who Strongly Approved had never fallen below 40% for even a single day while Obama was President-elect or President. Two new national polls suggest that support for an $800 billion stimulus plan to pump up the economy has slipped since mid-January, but may have stabilized in the past week. Fifty-one percent of those questioned in a CBS News poll released Thursday evening approved of the stimulus package. That’s down 12 points from a poll taken January 11-15, the last time CBS asked the question. Thirty-nine percent opposed the plan, up 15 points from the previous poll, taken before President Barack Obama was inaugurated and before the House of Representatives passed an $819 billion stimulus package, with no Republican support, on January 28. A new USA Today/Gallup poll, also released on Thursday, shows virtually identical numbers to the CBS News poll — 52 percent favoring an economic stimulus plan and 38 percent in opposition. Fifty-two percent also favored an economic stimulus plan in a Gallup poll conducted on January 27, a week after the inauguration and the day before the House passed the bill that the Senate is currently considering. Scott Rasmussen said today that public support for President’s Economic stimulus, as it passed in the House yesterday, is slipping. This goodwill from the public during the president’s honeymoon is already ebbing badly where laws are made: in the House and Senate. Despite a pledge of bipartisanship, not one Republican could bring themselves to vote for the Democratic stimulus. Now onward to the Senate…. Public support for the economic recovery plan crafted by President Obama and congressional Democrats has slipped a bit over the past week. At the same time, expectations that the plan will quickly become law have increased. Forty-two percent (42%) of the nation’s likely voters now support the president’s plan, roughly one-third of which is tax cuts with the rest new government spending. The latest Rasmussen Reports national telephone survey shows that 39% are opposed to it and 19% are undecided. Liberal voters overwhelmingly support the plan while conservatives are strongly opposed. About 89 percent of business Chief Executive Officers interviewed don’t expect any change in the economy during the first six months of the year. CEO confidence in the nation’s economy has reached an new low, says the Conference Board’s latest quarterly report. The survey of about 100 top executives in a wide range of industries declined to its lowest level since the Conference Board began questioning the chiefs in the second quarter of 1976. Twenty-four of the 100 executives surveyed said they were confident about the economic situation in the fourth quarter, down from 40 who replied that way in the third quarter. The fourth quarter responses marked the second time since the survey began that the New York-based Conference Board’s measure dipped below 30. The low point came in the second quarter of 1980, when it was 29 and the economy was declining into a deep recession and inflation was heating up. “The erosion in CEO confidence is a reflection of the rapid and severe deterioration in economic conditions experienced in the final months of 2008,” Lynn Franco, director of board’s Consumer Research Center, said in the release. “It appears that business leaders are optimistic about areas they can control, such as their own business, but have a less positive viewpoint of issues outside of their control,” said Chuck Martin, CEO of NFI Research. Sixty percent of those surveyed back assistance for homeowners facing foreclosure, and 64% favor tighter regulation of financial institutions. But lukewarm support is shown for helping carmakers. Linda Forest cringes when she thinks about the millions of dollars corporate chief executives earn. She believes greed is to blame for the nation’s economic crisis. So the third-grade teacher from DeSoto, Texas, believes the pendulum needs to swing away from a less-regulated business environment to one with more government intervention and oversight to lift the country out of its morass. She is among the majority of Americans who favor the idea of Washington stepping in to prevent any further collapse of the nation’s economy, according to a Los Angeles Times/Bloomberg poll. The survey of 1,000 adults was taken Saturday through Monday and has a margin of sampling error of plus or minus 3 percentage points. The poll showed that most of those surveyed favored increasing government intervention in the economy, and half blamed lack of regulation for many of the nation’s current woes. ¶ About two-thirds back tighter regulation of banks and financial institutions, and half said the federal government should take an ownership stake in banks and other industries to save the private sector.